There are two things to look forward to when attending an electronic music show. The first one is the quality of the sound — that is, of course, taking for granted that the music selection will be on point. The second thing is the DJ's presence behind the mixer. As soon as Catz 'N Dogz hit the stage, they established a connection with their audience. Through tongue-in-cheek, synchronized dance moves, the Polish duo displayed a quirky personality that complemented their labyrinthine acid house, and managed to charm the crowd. 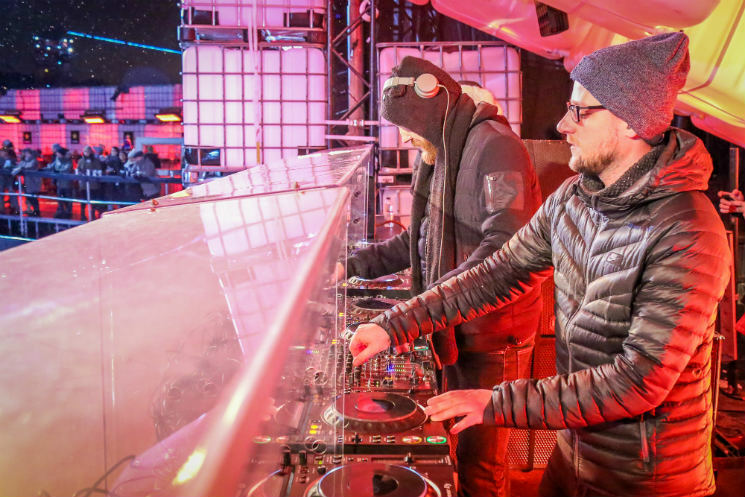 The Igloofest attendees gathered in front on the dance floor cheered every rise and drop with enthusiasm, slowly falling into a trance as Catz 'N Dogz's performance evolved towards percussive and repetitive grooves. As always, the lighting and the projections accompanying the set were breathtaking. BBBlaster's visuals, featuring colourful drawings of tigers and dragons, went hand in hand with the rhythmic movement of the spots overlooking the stage.